Like any other game Cyberstud Poker has certain rules. The Dealer must get at least an Ace-King to qualify. Should the dealer fail to qualify the player will be paid his bet and double his ante. The game is played with a single standard deck of 52 cards and has no wild cards. Your ante will remain on the table until the game is completed. These are the combinations that make up the standard poker hands and will be used in calculating the winnings of the player in this particular game. A K Q J 10 all of the same suit. This is a combination of five sequential cards of the same suit. E.g. 7 8 9 10 J of diamonds. This is a combination of four of the same cards. E.g. four 10's or four Jacks. This is a combination of three cards of one denomination and two cards of another denomination. E.g. K K K 9 9 or A A Q Q Q etc. E.g. 5 J 7 Q K of Hearts. Five cards in sequence of any suit. E.g. 6 7 8 9 10 or 8 9 10 J Q. Three cards of the same denomination and two unmatched cards. E.g. K K K 3 6 or 5 5 5 K 9. Two different pairs and any fifth card. E.g. J J 4 4 6 or A A Q Q K.
E.g. 7 7 3 J K or K K A 3 J. The hand includes an ace and a king. E.g. 7 3 1 A K or K A 3 J 7. In 1911, the state of California ruled that "draw" poker was a skill, and thus could not be banned under existing anti-gambling laws. However, "Stud" poker was still considered illegal at the time. This is a one of a kind online progressive stud poker game. It allows a range of bet sizes ranging from $2 to $101, and is connected to multiple casinos. New casinos are joining this system and constantly adding to the overall jackpot being offered to Progressive Cyberstud players. 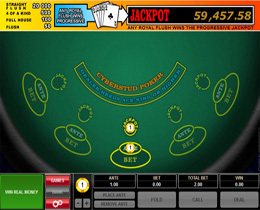 Progressive Cyberstud gathers deposits from its players at all participating casinos and creates giant 6-digit jackpots.